Using powerful, proven next-generation sequencing (NGS) and microarray solutions, researchers are now able to read and understand genetic variations at new depths, more easily and quickly than before, enabling a wide variety of genomics applications. As a result, discoveries that were unimaginable even a few years ago are becoming routine, for instance, CRISPR-Cas technology have the potential to carry out genome editing functions or alter gene expression for gene silencing, DNA free gene editing, homology-directed repair, transcriptional repression, knockout screening and embryonic stem cell. Currently, The CRISPR system is revolutionizing the way biological researches are conducted and paves a bright future not only in research but also in medicine and biotechnology. Goldstein Research analyst forecast the Genome Editing/Genome Engineering market size is set to reach USD 8.56 billion by 2025, at a CAGR of 13.2% over the forecast years. The major factors propelling the growth of this market are increasing government funding and number of genomics projects, high prevalence of infectious diseases and cancer, technological advancements, increasing production of genetically modified crops, and growing application areas of genomics and proteomics. The report covers the present ground scenario and the future growth prospects of the Genome Editing/Genome Engineering market for 2017-2025 along with the data of research and development projects on genome editing coupled with the investments and organizations involved worldwide. We calculated the market size and revenue share on the basis of revenue generated from major players across the globe. The Genome Editing/Genome Engineering market is forecasted on the basis of revenue analysis, product benchmarking and strategic developments of key market players. The report also includes micro and macro factors essential for the existing market players and new entrants along with detailed value chain analysis. Based on technology, CRISPR accounted for the largest technology segment with the market share of 45% in the genome editing/genome engineering market in 2017 with its ability to perform multiplexible genome targeting in many species that were intractable using old genetic perturbation techniques. While on the basis of application, cell line technology is leading the genome editing market due to its implications while studying loss or gain of function mutations at the endogenous level and identifies responsive or resistant patient populations in a human cell line model. Global Genome Editing/Genome Engineering Market Outlook 2017-2025, has been prepared based on an in-depth market analysis from industry experts. The report covers the competitive landscape and current position of major players in the global Genome Editing/Genome Engineering market. The report also includes porter’s five force model, SWOT analysis, company profiling, business strategies of market players and their business models. Global Genome Editing/Genome Engineering market report also recognizes value chain analysis to understand the cost differentiation to provide competitive advantage to the existing and new entry players. 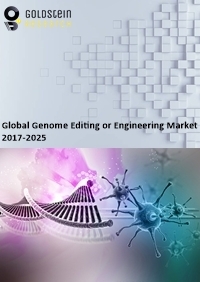 Our global Genome Editing/Genome Engineering market report comprises of the following companies as the key players: Horizon Discovery Group plc, Thermo Fisher Scientific, Merck, Horizon Discovery Group, GenScript, Sangamo BioSciences, Integrated DNA Technologies, Lonza Group, New England Biolabs, OriGene Technologies, Transposagen Biopharmaceuticals, Editas Medicine and CRISPR Therapeutics. According to the report, major driving factor is the adoption of genome editing/genome engineering for cell line engineering, genetic engineering, diagnostics and therapeutics. For instance, genome editing is used in target gene modification in plants and eradication of vector borne diseases such as yellow fever, dengue, Zika, West Nile, Schistomiasis, Leishmaniasis and Lymes disease which is the segment that is attracting major portion of investments in agricultural and healthcare sector. Further, the report states the biggest challenge is the complex nature of the drugs coupled with high development costs, sub-optimal development framework and inter-patient variability of effects contributing to potential barriers that are integrating genome editing/genome engineering into underserved medical settings. Based on geography, North America accounted for the largest share of the overall genome editing/genome engineering market in 2017 at over 35.25% owing to increasing use of genetically modified crops, the development of gene therapy in the US, rising prevalence of infectious diseases and cancer, and rising availability of research grants and funding. While APAC is expected to witness the most significant development owing to strengthening economies of developing countries such as India and China and the increased focus of the respective governments on encouraging research in the field of genomics, in addition, China hosts the world’s largest genomic research institute, the Beijing Genomics Institute in order to sustain the growth of genome editing/genome engineering market. Europe genome editing/genome engineering market will grow at the substantial rate due to the ample amount of funds and presence of companies undertaking research in the field of genomics.